Review by AllTheBestFights.com: 2015-07-25, some good single shots between Edson Barboza and Paul Felder but it is not enough to get three stars: it gets two (UFC Fight of the Night). The black belt in tae-kwon-do Edson Barboza entered this fight with a mma record of 15-3-0 (73% finishing rate) and he is ranked as the No.15 lightweight in the world while his opponent, the black belt in karate and tae-kwon-do Paul Felder, has a perfect record of 10-0-0 (70% ko/tko victory rate – he has never won via submission) and he entered as the No.41 in the same weight class. Both fighters have already fought once in 2015: Barboza has lost to Michael Johnson (=Barboza vs Johnson), while Felder has won over Danny Castillo (=Castillo vs Felder). 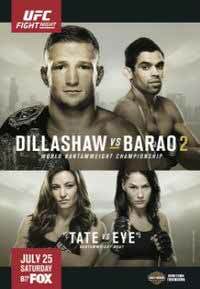 Barboza vs Felder is on the undercard of TJ Dillashaw vs Renan Barao 2 – UFC on Fox 16. Watch the video and rate this fight!